Just when you thought LoopLink couldn't get any better... it does. Regardless of the type of ground heat exchanger design you are working on, you have to provide some information about the thermal properties of the ground. For many users, selecting a representative formation thermal conductivity and/or formation thermal diffusivity has been a stumbling block. The tables can be a little intimidating (especially for horizontal trench) and soil/rock is just something many people don’t know that much about. In our latest update, we added tools to help estimate the thermal properties of the ground customized to the needs of the type of ground heat exchanger you are designing. In vertically or horizontally bored GHEX, the formation thermal properties are a weighted average of each layer of soil/rock through which the bore passes. You can now create a drill log for either of these types of systems and LoopLink will automatically calculate and report the estimated thermal properties of the formation. The drill log you define can also be saved and included as part of your printed reports. There is a lot going on in the soil table for horizontally trenched ghex and it is intimidating especially for the uninitiated. So, we took some time and thought about how the table is read by a person and created an interactive tool to guide you through the selection process. 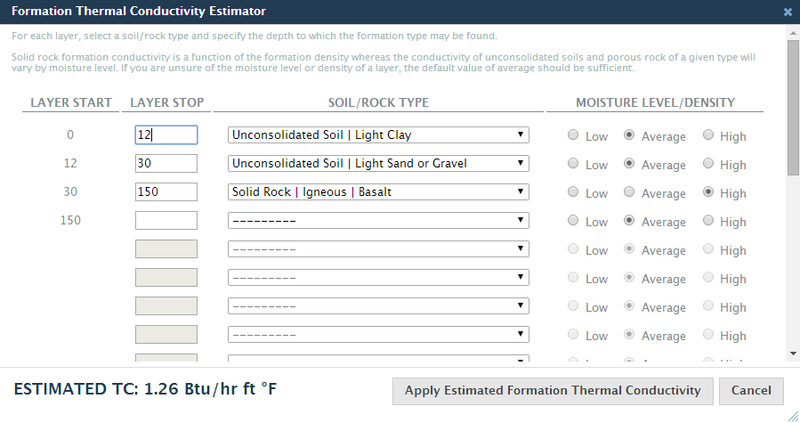 Now you just need to specify, the density and moisture range for your formation as well as the basic composition of the soil by percentage of sand, silt, and clay. LoopLink will narrow down your options and make suggestions for the closest 1-3 soils from the table. 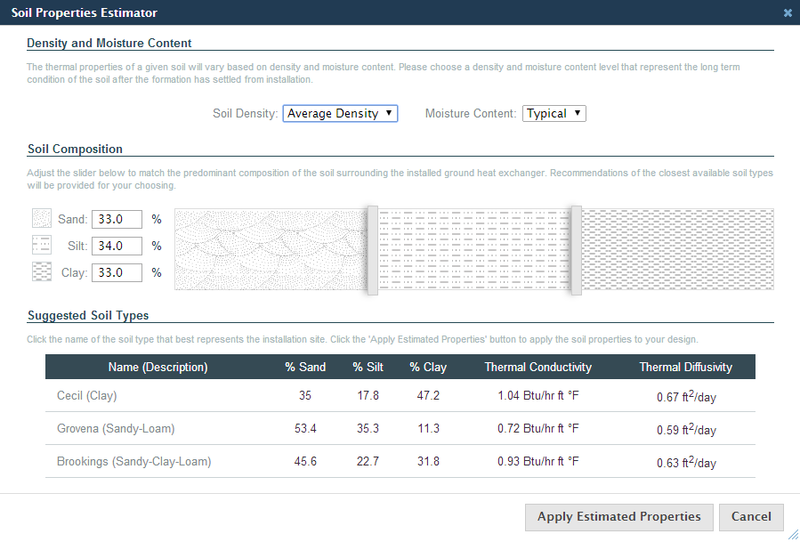 Once you make your selection, click ‘Apply Estimated Soil Properties’ and the thermal conductivity and diffusivity will be updated for your design. It is important to note that these new tools are just providing estimates. Even with a drill log defined, you can still directly set your thermal properties. Which you should do if you have actual formation thermal conductivity test results. Help files are awesome but sometimes we don’t feel like reading either so, we started making help videos. We don’t have them for every section just yet but you will notice a new play button popping up next to the help link in the sections where videos are available. These are made more for first timers than our old pros but if you get stuck, they can give you a nudge in the right direction. Like everything else in a well maintained system, these are a work in progress and we will continue to add new content and improve over time. This new feature is something that users of our manufacturer versions will appreciate most. Have you ever Googled ‘LoopLink’, gone to looplinkrlc.com and been told that your log in information is invalid but you KNOW it is right? Often times, your log in information is correct but, you are on the wrong website. This happens a lot more often than we thought it would when we started building the manufacturer versions so we changed our approach to logging in a little bit. Now, if you are using good information on the wrong site, we will provide you with a link to the correct site. For a bunch of reasons that are too boring to detail, we don’t log you in automatically but, we now direct you to where you need to be to log in to your account. We do a lot of testing and try to be careful before any release but sometimes it takes pushing our work into the wild to find problems. There were a couple of noteworthy bug fixes that we completed in this release. You may now include special characters like é,ô,à,ü,° in the text fields of LoopLink without crashing the report system. We unfortunately can’t support all character encodings. LoopLink will do its best to include these characters in your reports but if the character cannot be reproduced, it will be skipped and your report will still be generated. Our explorations into character encodings made it possible for us to switch units of ft^2 in reports to the much cleaner looking ft2… not really an error but it was something that bugged our report designer. The ‘% Energy From Geo’ calculation has been corrected for systems that use non-electric supplemental or dual fuel technologies. This issue had no impact on design calculations so critical values like bore lengths, operating costs etc. were unaffected by the error and the subsequent correction.